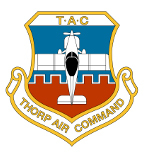 Thorp Air Command - T18.net • View topic - Anybody have sidewall interior dimensions in CAD? Post subject: Anybody have sidewall interior dimensions in CAD? Just checking to see if anyone had their interior dimensioned in CAD so I could be very lazy and send the CAD file out for making my interior. Is that Thorp heresy? Post subject: Re: Anybody have sidewall interior dimensions in CAD? I think I did my CAD (Cardboard Adjusted Design) using high tech material from the 99 cent store as a template ! I just had my panels out for the conditional . I could have made a paper template for you . If you can wait another 11.5 months I can send you a template ! yea, I figured I was trying to make things more complicated than necessary! Just imagine how much better you'll feel knowing you spent hours and hours making templates using the time tested cut and paste method ! The satisfaction of a job well done and the countless stories you can tell around the campfire or at happy hour ! "Get Crackin !" Ryan, my sidewalls are out of my plane while I work on the interior, but they're covered with upholstery. I could send you a tracing on brown paper of the outside edge. Would that be of any help to you? Thanks for that very kind offer John, but I have completed my interior/upholstery measurements.